Players on the field, anthems being played. Game starts 4:50pm local time. 19 degrees C.
Players ready 3 mins early. Underway. PNG players quick and skilful but completely unpredictable to each other including their forwards. Ireland's size bothering them. Lucey and Finn too big up forward. Mozzies giving away a lot of frees around the ground. Peni marks and kicks 48m goal after the 1/4 time siren for massive morale boost to PNG. (May have been Beno, some PNG players not wearing their assigned numbers, as usual). All PNG in 2nd quarter, but little to show at first. Now starting to put it on the board. Margin down to 4 pts to Ireland. Lights are on. Ireland by 5 pts at 1/2 time. PNG speed and pressure has them on top around the ground now. Full match report to come later. The match is underway at Punt Road Oval, next to the MCG. Undefeated Canada Northern Lights taking on undefeated Ireland Banshees. Beautiful sunny conditions. Very physical match, umpires playing a lot of free kicks. If Canada had kicked straight it would be over at half time... will there be regrets? 2nd half underway. Ireland get their first goal but Bodashefsky hits back with 2 goals for Canada. Cloudy and cooler now. A few high hits and quite heated, Ireland's star Laura Corrigan sent off yellow card after getting Aimee Legault high. Last 1/4 about to start. Ireland battling hard but again bogged down in defence. Canada will win the 2nd Women's International Cup. Canada Northern Lights win IC14 Women's 5.8 (38) to Ireland 2.0 (12). Big celebrations on the field, plenty of support from Canada's men side. Congratulations Canada, the new women's powerhouse. Impressive rise in just a few years, and the depth to bring two teams to IC14. 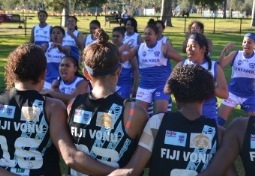 For the debut womens sides from Fiji (Vonu) and Tonga (Thunder) the last match of the tournament was a chance to finish the tournament on a high. Combined with a perfect late August Melbourne morning on the Western Oval the game got underway – a little late – the weather may have been perfect but the traffic wasn’t. The Western Oval at Royal Park glistened with the morning dew catching the sunlight – and with little if any breeze it was as good weather as had been offered over the previous fortnight. The Vonu had managed a win against the USA Liberty while the Tonga Thunder had had thus far a fruitless tournament with respect to wins. But wins aren’t everything in a tournament like this. When the Tonga ladies performed the Sipi Tau it was as much for the friendly benefit of their Fijian opponents as it was for intimidation. Winning isn’t the be all for a tournament like this. Tonga won the toss and elected to kick to the 'right of screen' - the western end. And when the game got underway the contest was willing, the niceties of the pre-game forgotten and it was clear that the winner today would need to work hard – because, while winning isn’t everything in a tournament like this – it is national pride on the line and winning sure helps. France notched their second win for the tournament with a 74 point smashing of Pakistan on McAlister oval on a bright sunny spring-like afternoon. There wasn’t a great deal of spring in the first quarter as both teams felt each other out. Pakistan started positively and had good movement around the packs. The first goal of the match came from the youngest man in the team as Simon Mondin kicked truly. Hussain roved the pack nicely to get Pakistan on the board and the sides looked to be matched up pretty evenly. The second French goal for the quarter was a classy effort by the French captain Patacq had a bounce on the run and slotted it home. The International Cup Gala Dinner was on tonight and as is tradition World Teams have been named from both the Men's and Women's competitions at the International Cup. Teams were picked utilising umpire votes, official team votes and the views of the AFL selection panel. Captain of the Women is Canda's Aimee Legault, whose passion for Australian football is such that she moved Down Under to play at the highest level. For the Men it is Ireland's Mick Finn, also now based in Australia and a key to their 2011 Cup win and likely to be vital tomorrow on the MCG. Legault and Ireland's Laura Corrigan were named Female Player of the Tournament, and Finn was named Male Player of the Tournament. The Women's side features 9 Canadians, 6 Irish, 5 Americans, 1 Tongan and 1 Fijian. The Men's is dominated by the usual big 4 international sides: Ireland (4), PNG (3), NZ (3), SA (3). The remainder are from Canada (2), GB (2), USA (2), Nauru (1), Fiji (1), Tonga (1). 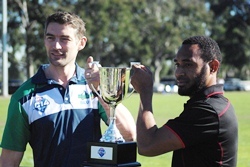 It was a slightly dewy morning, even under the bright sun lacking on most days of this festival of footy, when the Finnish Icebreakers and the Japanese Samurai took the field on Ransford Oval at an early 9 am on Friday. While both teams had struggled against either bigger teams (the Japanese) or more experienced teams (the Finns), it would be a morning of stormy weather for the players from Turku, Salo, Vaasa, and Helsinki. After several matches they had lost some players to injury, others (exchange students and local Finns) to exams, and were soon playing with 17 men – their vacant interchange bench contrasted with the to and fro of the Japanese team. The first quarter produced some of the best football of the tournament, from the Japanese team. The Japanese combination of sure ball handling, confident marking, sharp passing, chains of handball, switching play, run on football and the metres gained was copybook stuff. 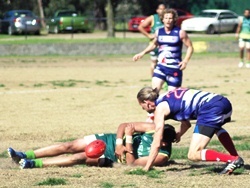 It was only qualified by indifferent kicking for goal. Both offline shots and kicks falling one to two metres short. 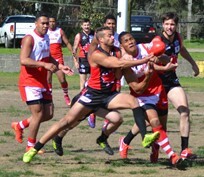 With the early afternoon sun at McAlister oval nudging the temperature around and over 20C – the Canadian Northwind lined up ready to face the Tongan Storm in the 5th v 6th battle to decide the Division 1 premier. With a negligible breeze from the south aiding the Tongans it was the Northwind that looked sharpest from the outset. At just 165 centimetres in height, Amina Humi might go close to one of the smallest full backs going around. Hard to image her up against modern day giants like Daniher (201cm), Tippett (202cm) or even Cloke (196cm). But in her own field, harassing opposition full forwards, she is a Tongan giant. Our interview took a different direction. As a Hawthorn supporter, she still lists her footy idol as Lance Franklin. Amina says that her career highlight to date has been this current International Cup. At just 21 years of age, Amina, who plays for the Nukalofa team back in Tonga, should look forward to a long career representing her country.